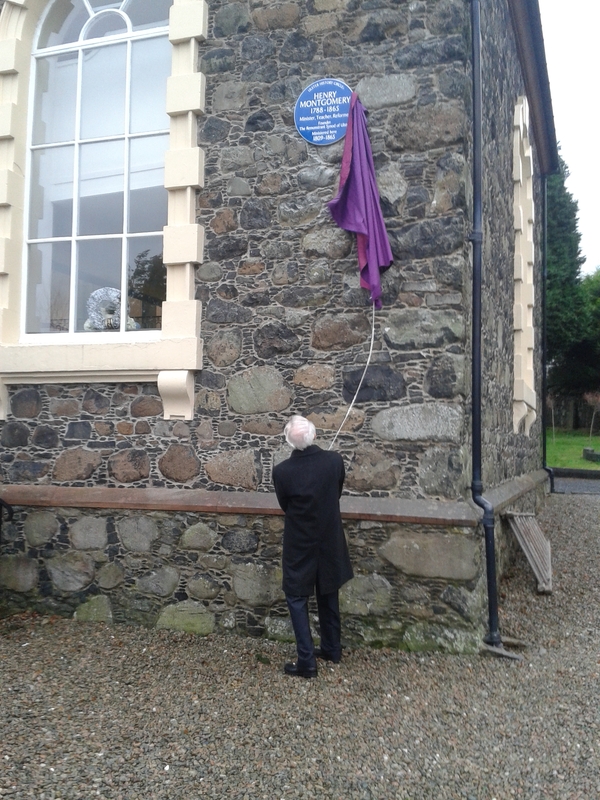 A good number of people braved winter weather, heavy traffic and seasonal busy-ness to attend the unveiling of the Ulster History Circle Blue Plaque commemorating the Rev Henry Montgomery (1788-1865) on the walls of his old meeting house in Dunmurry on 18th December 2015. 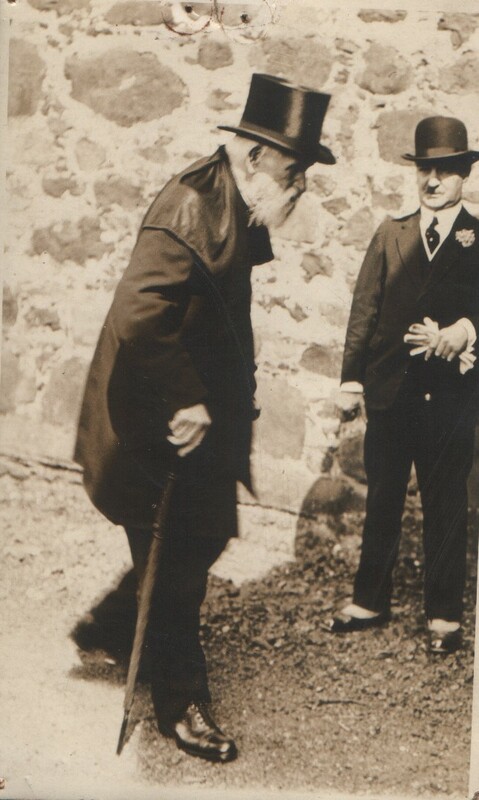 Appropriately enough the unveiling was done by the Very Rev William McMillan, Henry Montgomery’s successor for 45 years and undoubtedly the person most knowledgeable about his life and career. 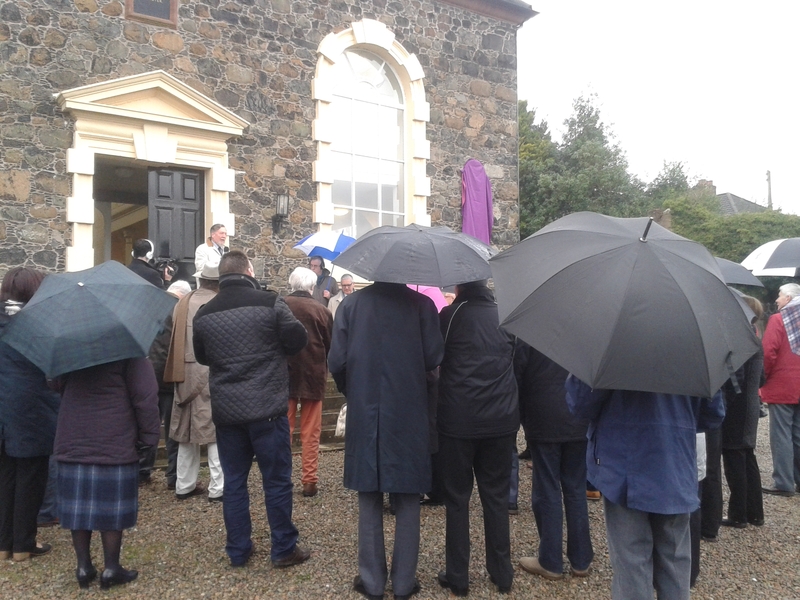 The premises and grounds of Dunmurry have always been immaculately kept and the meeting house provided a very suitable space for the speeches immediately after the unveiling. This has been a year of commemoration marking the 150th anniversary of Henry Montgomery’s death and, as Ian Crozier observed in his speech, the Ulster Scots Agency had assisted in the republication of Bill McMillan’s booklet on Montgomery, A Profile in Courage, first published fifty years ago and still the most useful introduction to his life and work. 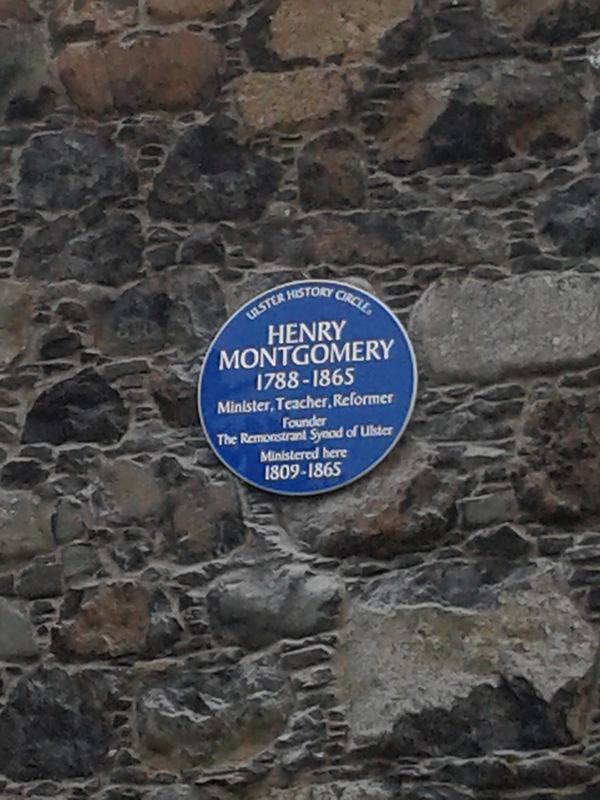 As was also pointed out in the speeches this is not the first blue plaque to a Rev Henry Montgomery (the other one being the founder of the Shankill Road Mission), and it is certainly not the first blue plaque for a Non-Subscribing Presbyterian, but I think it is the first blue plaque for a Non-Subscribing Presbyterian minister (although at least two sons of the manse have already made it onto a blue plaque). Never did his powers of eloquence shine out more conspicuously than when he was denouncing tyranny, in other lands or his own; or pleading for the rights of humanity. 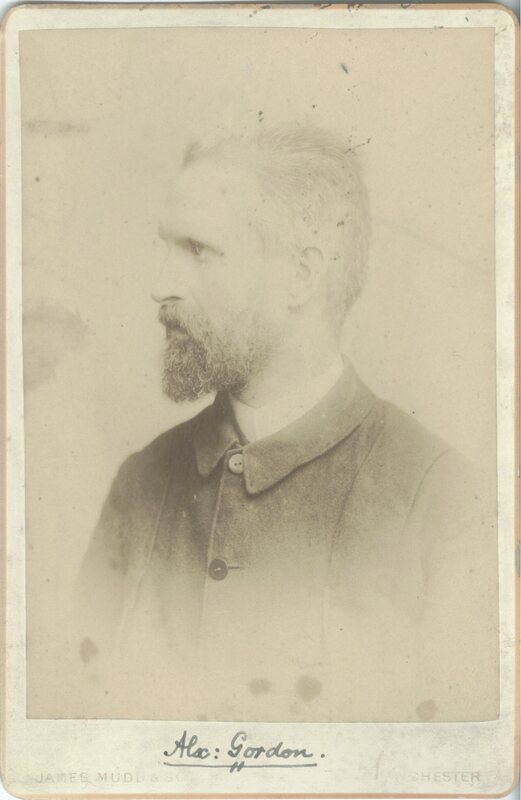 He contended that a man’s religion should never subject him to penalty or inconvenience and he claimed liberty alike for Protestant and Catholic, for Christian, Jew and Deist. Very much a pioneer and champion of what today would be called human rights it seems fitting that he should be remembered. Henry Cooke, his old opponent, after all has a prominent statue, Henry Montgomery certainly deserves his plaque.